Expo MRT is located at 21, Changi South Avenue 1 in Singapore 486065. It is enclosed within the Changi Region. Changi is an area that is situated at the eastern section of Singapore. 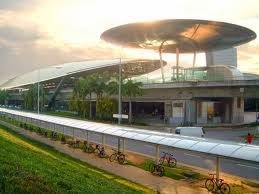 It has the two ferry terminals namely, Changi Point Ferry Terminal and Changi Ferry Terminal. Nearest MRT is Expo MRT station and the closest bus interchange is Tampines Bus Interchange. Amenities in the area include Eastpoint Mall, NTUC Fairprice and Cold Storage Supermarket. Some of the schools close by are Changkat Changi Secondary School, Changkat Primary School and Bedok South Secondary School.